Fry the onions cutted into thin slices and add the spices. Blend for a couple of minutes and add the rooster previously cleaned and cutted into small pieces. Now add a cup of water and a cup of wine and let it boil for about 15 minutes. Dilute the tomato paste into one cup of water and put it into the pot, cover and let it boil for one hour and half till the sauce will be thick. Into another pot cook the pasta and when it's ready, take out the meat from the sauce and add the pasta. Blend everything and serve in a plate the pasta next to the meat. Cover everything with Grana cheese. 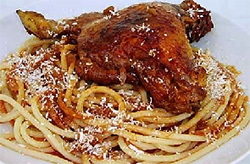 You can prepare the Pastitsada also using beef meat. 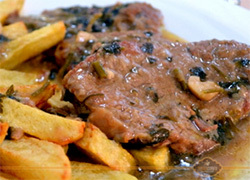 Cut the veal meat into slices, chop the parsley and cut very thin also the garlic. As you have this ingredients prepared, press the slices of meat and then cut it into small pieces. Clean the meat, dry it with kitchen paper and then cover it with a mix of flour, salt and pepper. Fill a frying pan with oil and when it’s hot put inside the meat, the parsley, the garlic and mix everything with a spoon. Pour into the frying pan a cup of hot water and the vinegar, cover and let it boil slowly for about 40/50 minutes. Clean and cut into small pieces the fish you have chosen. Put the oil into a big casserole and let it become hot with low fire. Then add the red pepper, the onions previously cutted thin, the minced garlic and let it cook for an other couple of minutes. 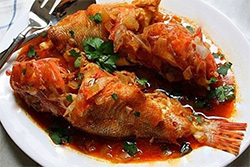 Husk the tomatoes and cut it into small slices, cut also the potatoes into small pieces and add them together with a cup of water into the casserole. Cover and let it boil for about 20 minutes. Add now the fish and a little bit of black pepper, than cover again and let it cook for another 25 minutes. Mix the minced almonds with cinnamon. Melt butter and grease the backing tin; spread the puff pastry greasing it; put three layers of pastry then alternate the pastry and almonds and cinnamon always greasing them with butter. Divide the filling so that you can use 4 layers of puff pastry to lay without filling. 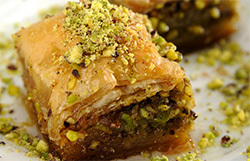 Grease the last layer and cut the baklava in a shape of a diamond. On every piece put in the middle a piece of clove. Prepare the syrup mixing sugar, water, vanilla and lemon juice, do not make it too thick, and when the cake is ready pour it on.